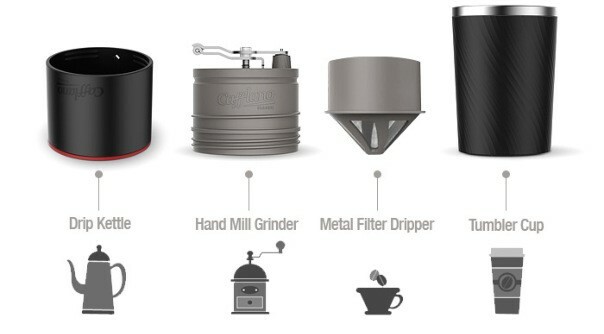 The Cafflano Klassic is an all-in-one coffee maker, portable for coffee lovers “on the go”, and can be used with your favorite coffee. It’s also eco-friendly as it requires no electric power, disposable filters or cups. Operation is simplicity itself, you just unscrew the components, drop the Filter on top of the Tumbler, screw on the Grinder and add 10/15/20 or 25g of beans – there is a handy measure on the inside wall of the Grinder that’ll give you the increments. You then flip over the handle and crank away. Once you’ve turned the beans to powder (or more likely a coarser espresso grind), you remove the Grinder, fill the Drip Kettle with 250ml of very hot water, add the detachable lid – which screws on to bottom of the pourer – and trickle on some water to swell the grounds. After around 30-45 seconds you pour on the rest of the water and leave to steep. In a few minutes you’ll have a cup of hot coffee, which will stay warm for a decent amount of time in the insulated. 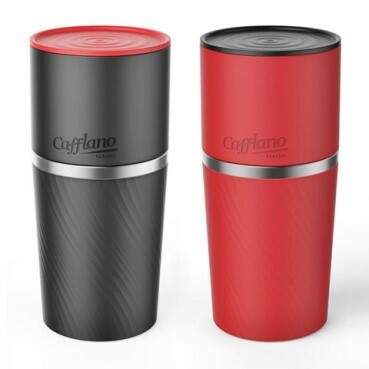 The Cafflano Klassic (in black) is available to purchase through The Coffee Warehouse for $150 plus postage. If you would like to order a Cafflano Klassic, please contact Andrew on 0412 203 921 or email him at andrew@nullcoffeewarehouse.com.au for a quote including postage within Australia.